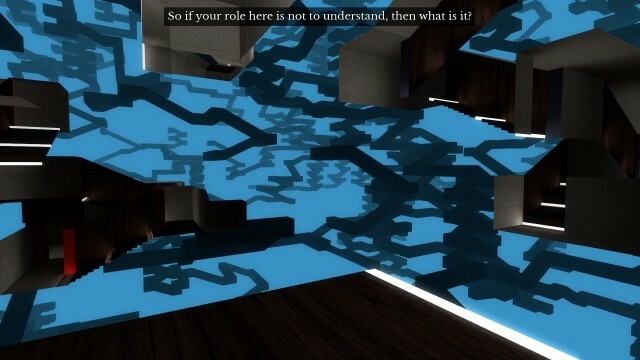 The beginner’s guide is a game in the style of the author’s previous game (for which he was part of a team), The Stanley Parable. It’s similar in that the mechanics are you walk though and experience it more than you play it, the game is in the narrative. It’s presented as a compilation of one-shot games by a developer named Coda, that Davey wants to present to the world. The game is dark, and deep, and what you see at the bottom may depend on who is looking. It is the dark mirror of the Stanley Parable, and exactly as explicable. I love that it exists. I love the game. I will now delete it from my hard-drive and never be tempted to launch it again. The rest of this article contains spoilers, and you shouldn’t read beyond this unless you’re pretty sure you’re not going to play it by the above. Towards the end, it becomes clear that by imposing his need for more games that *he* would enjoy, the narrator has driven his muse to stop producing games at all. In fact, Coda – the developer – begins to feel trapped in his own outlet, games he made for himself, for his own entertainment, for his own personal expression have been hijacked and analysed and then “fixed” by the narrator, and then the narrator – a fictionalised version of the game developer, Davey – has bundled them together for release in order to “encourage” or, to put a better way, pressurize Coda into developing more games for him, Davey. Coda becomes the only way Davey can look at himself, and placed high on that pedestal, cannot deal with being someone else’s idol. “Davey”, in turn, uses Coda’s games – shops them around to friends, and eventually puts this up on Steam – to feel part of them, to feel like they were his in some way, and presents his public over-analysis of Coda’s game designs as depression, as shutting himself away, when it’s actually Davey’s appropriation of his games, and Davey’s own unresolved problems, that’s making it hard to produce. On Coda’s side there’s a lot in there about pressure, about having to explain everything as a psychological basis, about being in public, about opening yourself up for evaluation. On Davey’s side there’s a lot about the need for external validation, and the escalating need for more. About the perils of relying on other people as perfect templates, and the pressure it puts on them and on you. Plus, Coda and Davey are the same person, possibly. One interpretation is that it’s Davey before his games got popular (supported by something he wrote a little while after The Stanley Parable went supernova, and some other stuff). My personal theory is that the narrative of the game is of two people, but the reason for the game is that they’re both the same person, and I’m doing that thing, and I should stop. Yeah, 1am on a sunday night wasn’t the best time for me and this game, it’s going to be a long player in the background of my head. My relationship with feedback’s never been especially healthy, and it’s been a bad few months for creative works for me in part due to that.